There are a lot of 'firsts' in the few months between September 1856 when Marian Evans Lewes began 'The Sad Fortunes of the Reverend Amos Barton' and February 1857 when she adopted George Eliot as a pseudonym. The Bartons were the first of her many families. The words of the title were, according to her own recollection, the first words of her new career. She was at the time in the process of making a new, it could be argued, a 'first family', in the new life she was sharing with George Henry Lewes and his young sons. And George Eliot, himself or herself, made a first appearance, born of the new Evans-Lewes family and already the bearer of the Bartons. 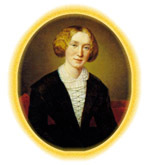 The creation of 'George Eliot' is the most important of a series of renamings which mark Mary Ann Evans's struggle to find a satisfactory family for herself. Mary Ann had been a lonely and misunderstood girl with little social identity outside the Evans family. After her father's death, finally free of family roles, she changed her given name from Mary Ann to the more adult Marian. Later, when she made her lifelong commitment to Lewes, she changed her family name to become Marian Evans Lewes. Now, the personal partnership with Lewes freed her to become George Eliot. Finally willing and able to risk putting her creativity into print, Marian Evans looked to memory for material. But the memories of her family were as yet too painful. Indeed, as a child she had felt less at home with parents in Griff than in the countryside immediately around Griff. She chose local settings for the Scenes of Clerical Life, 'scenes' in which she had been born and raised, where as a child she had felt most secure and comfortable. She chose 'clerical life' for her first story because the parish seemed to her the most natural of social organisms, and because through the clergy she could get the widest perspective on the whole village. And writing about the clergy lent itself to Marian Evans's wish to establish George Eliot's respectability. A return to her intense early immersion in religious and church affairs was an additional source of confidence. She began her first fiction with the village church because that was where she felt most secure as a writer. It was surely also one of the places where she felt safest as a child.